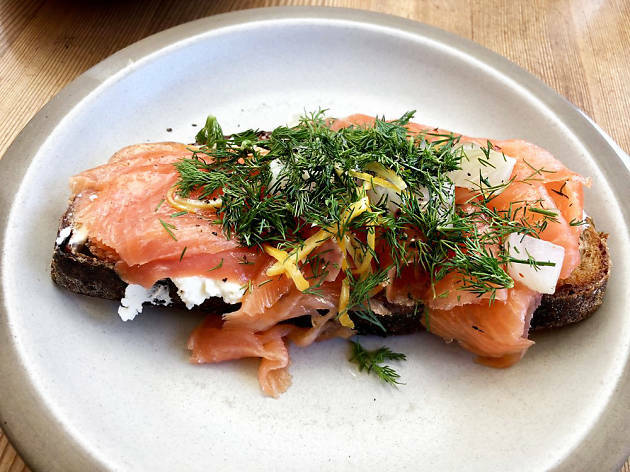 It’s been a whirlwind of a year for new L.A. restaurants, but it’s not over yet. One of 2018’s biggest openings is still slated to slide in just before the New Year, bringing roughly 40,000 square feet of world-renowned baked goods, pizzas, a marketplace, a supper club and a coffee roastery to the Arts District’s premier mall. We’ve been waiting nearly a year for the Manufactory, the whopping multipurpose space from the minds behind Tartine and Pizzeria Bianco, among others, and in December, the complex’s concepts—including three restaurants—are set to begin rolling out in phases. Turn your eyes to the former American Apparel warehouse, which sits snuggly along the edge of ROW DTLA, because this is an opening to watch. A lot of big names are behind this complex, making it one of the most anticipated openings of the year. Here’s a who’s-who to get you started. There’s of course Tartine, one of San Francisco and the baking world’s gems, which means husband-and-wife chefs Chad Robertson and Elisabeth Prueitt will be overseeing much of the bakery and food menus; completing the Manufactory’s trifecta of James Beard Award-winning chefs is Chris Bianco—of Arizona’s acclaimed Pizzeria Bianco—who’ll also be helping craft the menus (more on those later). Below deck there’s a massive coffee roastery, which will provide beans for who else but Tartine’s sibling concept, Coffee Manufactory, the award-winning and sustainability-focused company whose product has become a staple of Bay Area coffee houses—and a few down here in L.A., as well. But they’re not going it alone: In partnership with Califia Farms—the milk-alternative company that’s begun a rapid product expansion—this subterranean coffee roaster will become the flagship for Califia’s budding packaged coffee products such as bottled cold brew. Both brands already work in tandem: Califia allowing Coffee Manufactory to source in larger quantities, while Coffee Manufactory lends its years of expertise and contacts in the brewing world. Now, they’ll be doing it under one roof, with a much larger output. If all that info worked up an appetite, The Manufactory should have something for you between its, oh, three restaurant concepts. 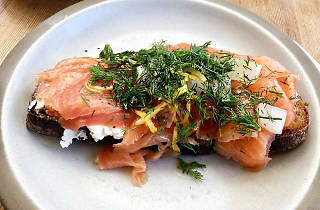 There’s the all-day café, Tartine Bianco, which is where you’ll always be able to find colorful smørrebrods (open-faced sandwiches) piled with farmers-market haul—a signature item of Tartine’s. We’re also betting you’ll be able to find some variation on Bianco’s pizza here, too. If you’re simply a bit peckish, stop by the bakery, which has been “designed as a visual showcase,” and will no doubt display the golden, crusty loaves of bread and artful croissants and other pastries Tartine is known for. Those looking for a more intimate experience will most likely find it at Alameda Supper Club, the “elevated,” dinner-only restaurant brought to us by Bianco and Robertson, tucked into a corner complete with its own indoor bar, patio, outdoor bar and a 16-seat private dining room. Not much has been divulged as to the Manufactory’s menus, but this particular concept is one we’re already eyeing. The marriage of Coffee Manufactory and Califia Farms, this is where you can find a small retail section for both brands’ goods, plus the occasional guest roaster takeover, importer event and competition, such as something like the U.S. Coffee Championships qualifiers. Dubbed the Row Roastery, the 6,000-square-foot space beneath the main floor will serve as the in-house bean roaster for both Califia and Coffee Manufactory. The best part? Windows allow passersby to see the coffee process in action, from cleaning to roasting to bagging. The setup, which includes a gargantuan, refurbished 1961 120-kilogram Probat coffee roaster, is just about ready to switch on and roast 70,000 pounds of beans per week—that’s more than 3 million pounds of coffee annually. Take a little piece of Tartine home with you, or use this space to discover other West Coast makers. The Manufactory’s market will include a range of products made onsite, including a gourmet salad bar, sandwiches, bread and pastries, in addition to a pizza program featuring various styles from Robertson and Bianco. Expect charcuterie, cheese and a pickle case, not to mention pantry staples with a focus on items from West Coast, small-batch producers. Just want to pop by? Thanks to the market’s walk-up window, you can even grab ice cream, coffee and pastries as you breeze by on Dock Street, making the Manufactory a serious one-stop shop, no matter your needs. The Manufactory is located in ROW DTLA at 757 S Alameda St, set to open its concepts beginning in December.